Take a quick moment to think about all of those dog essentials that you bring along with you on your daily walk. Leashes, poop bags, treats, keys, cell phone? Perhaps water for a longer walk or hike? It doesn’t help the matter that athletic gear (especially women’s) rarely has any pockets. Juggling all of these things can be a real pain. Wouldn’t it be nice to have an easy way to carry everything with you? 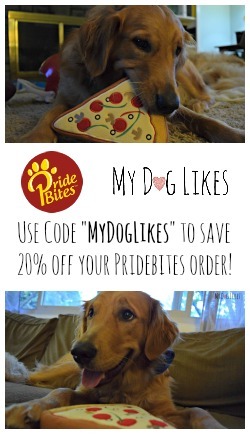 Here at MyDogLikes we are all about living a dog friendly lifestyle. While the majority of our reviews tend to focus on items made primarily for the dogs, today we are going to be showcasing something designed specifically for pet parents! Sarah teamed up with noted designer Sonya Cotter to make it happen, and after much hard work, Travel Wags was born! They now offer 2 different bags – The Walker and The Tote. 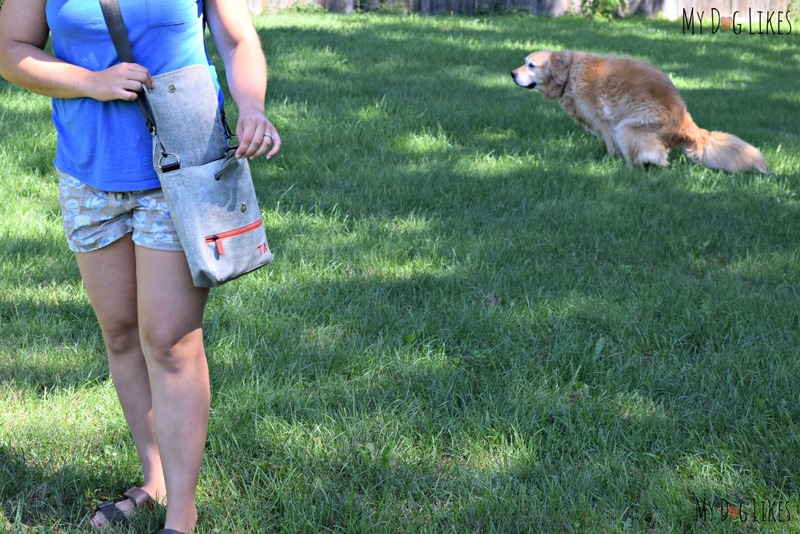 Travel Wags recently contacted us to see if we would be interested in reviewing and featuring their dog walking bag. Quite familiar with the difficulty of carrying everything we need, we were excited to check it out! Simply put, this bag is designed to hold everything you need on a walk with your best friend. The Walker is spacious, but it is also compact enough to be perfect for daily use. Not only is it functional, but it is beautiful as well. No one would guess that this bag is designed to hold dog supplies. A Stylish Dog Walking Bag? The Walker is a rectangular shaped tote-style bag measuring roughly 10″ on each side. It’s grey herringbone fabric is classy and neutral while the orange accents for the zippers and lettering give a nice pop of color. There is so much more than meets the eye with this dog walking bag! Let’s take a look at each feature one by one to see why it will make your walks easier. The Walker comes with a detachable, black, nylon strap for carrying. 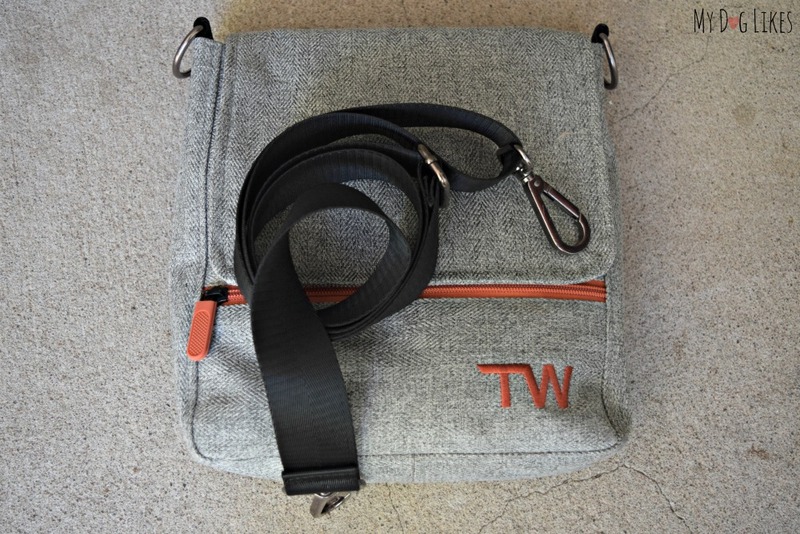 The strap is wide, smooth, and adjustable in length, allowing for the bag to be worn over the shoulder or cross body. I prefer to wear it cross body as it leaves both hands free for the dogs. The flap of the bag folds over and secures quickly with the aid of a magnetic clasp. No need to struggle to find the snap, or worry about it wearing out over time. We found that the clasp held strong even when we loaded up the bag and put some strain on it! 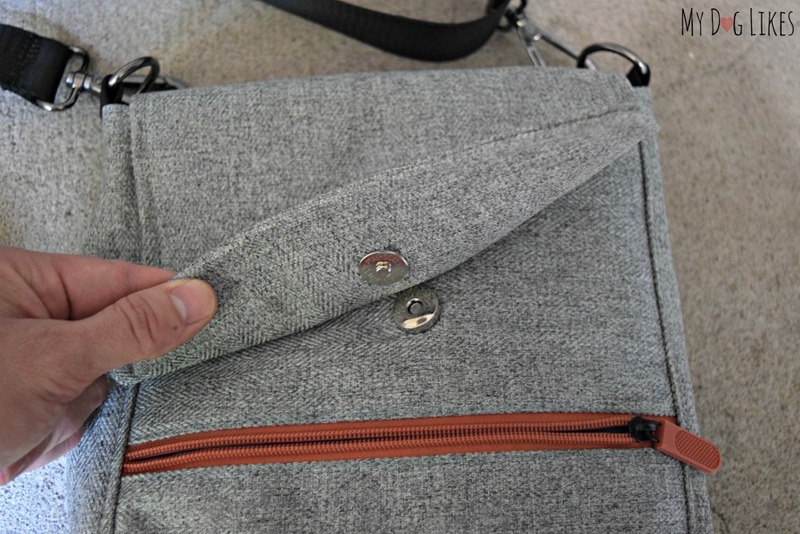 On the front of the bag you will find a zipper accessible pocket. 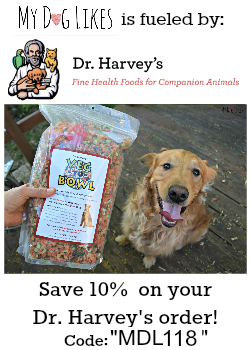 This compartment stretches along the width of the entire bag, and is perfect for storing something that you need easy access to – such as training treats! 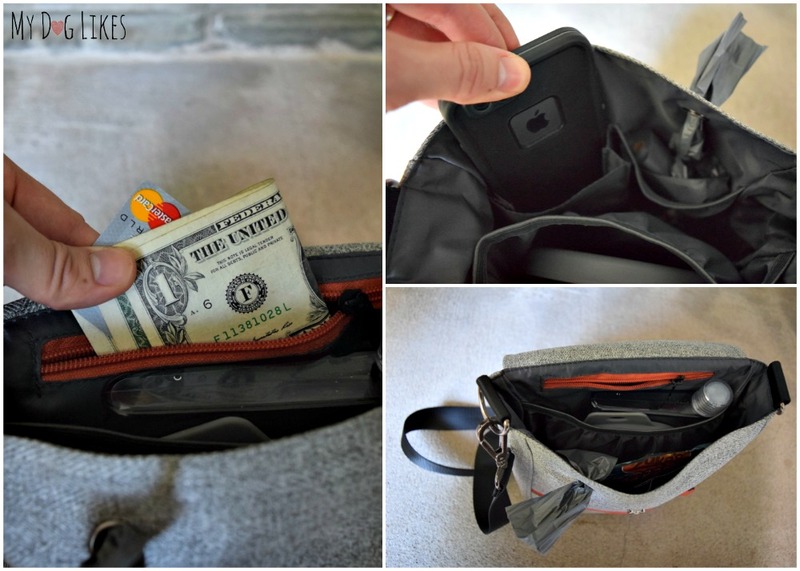 Travel Wags has included a number of different interior pockets into The Walker. One designed to hold a roll of poop bags that can be dispensed out the front. Another perfect for a cell phone or keys. A third zippered pocket can hold things you would like to keep a bit more protected like keys, money and identification. 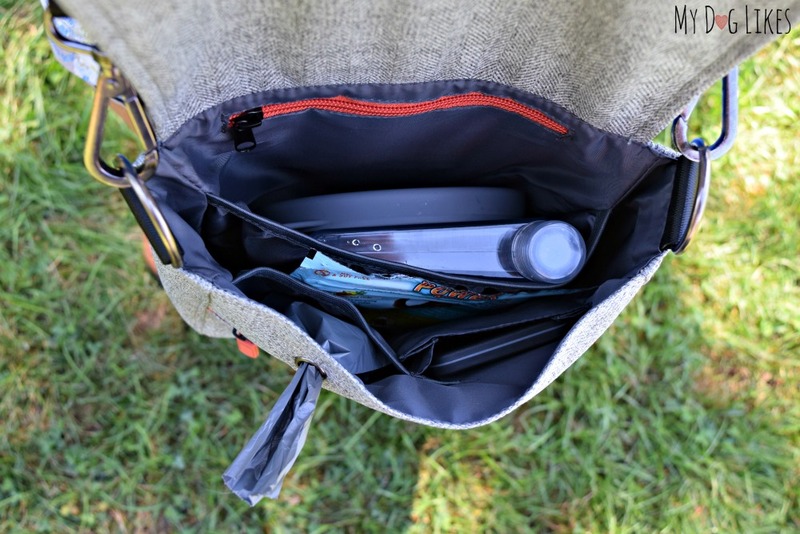 In addition to these pockets is a large open area giving you the ability to store a wallet, treat bag, book or anything else you may need while out and about. One of the most unique features of the Travel Wags bag is that there is a poop bag dispenser built right in! They even throw in a roll of bags to get you started! What’s Included with the Travel Wags Dog Walking Bag? Proper hydration is extremely important during exercise – especially in the heat of the Summer. But seriously, who wants to lug around a water bottle on a walk? Worse yet, if you were to bring a bag with you, most water bottles take up a ton of space. Travel Wags has designed and incorporated a custom, flat, water bottle to fit in a special slot inside the bag. Not only does this save room in the bag for other items, but it helps to give the bag shape and form. Simply put, this was a brilliant idea! We measured the capacity and were pleased that it holds 16 oz. 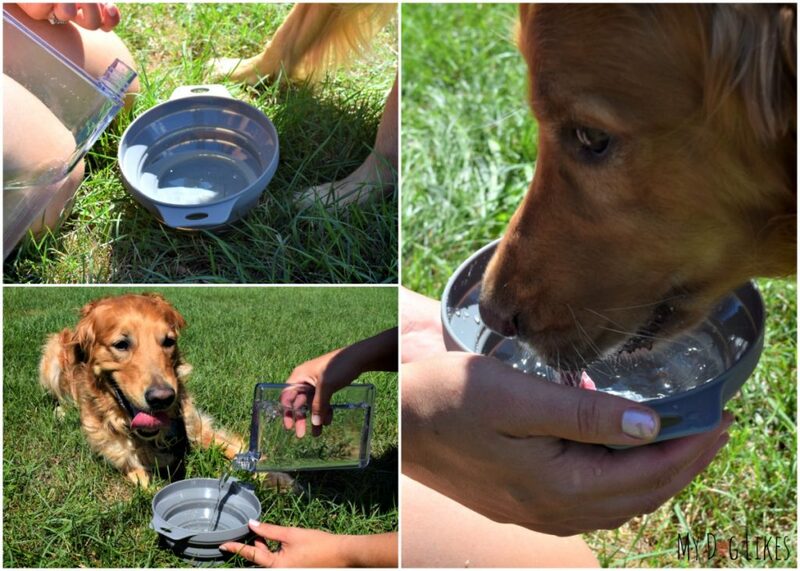 If you have water, your dog will need something to drink it from! The Walker includes a large collapsible dog bowl for that quick drink break on your walk. Take a look at the size of this thing! Much larger than other collapsible bowls we have used in the past. Anything that makes our lives easier is a huge plus in our book. The Travel Wags Dog Walking bag is the perfect accessory for pet parents. No longer will you need to struggle carrying all your dog gear, in fact you can conveniently bring along much more. While this bag is great for walks with your dog, its also great as an everyday bag. 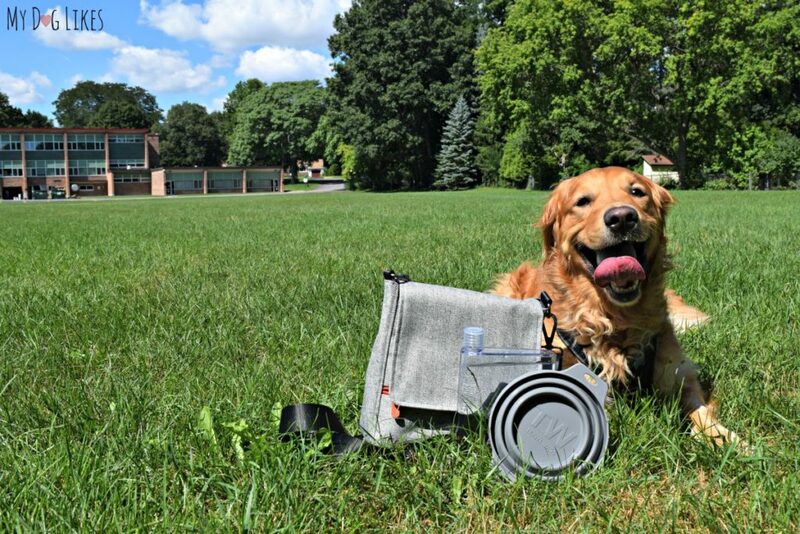 If your dog is as “on-the-go” as you are, you need this bag! Thanks to its classic design and stylish fabric, it easily and beautifully blends in as regular purse, while still meeting the needs of a busy pet parent! I also love the look of ‘The Tote’, Travel Wags’ larger bag. Though we didn’t review it, I can see this bag easily accommodating a bigger day/overnight trip. I’ve been looking for a great bag for a while and am so happy that we now have this bag. If you are the mom of an infant or toddler, you know how important the diaper bag is, to me-this bag is just as important as a dog-mom! 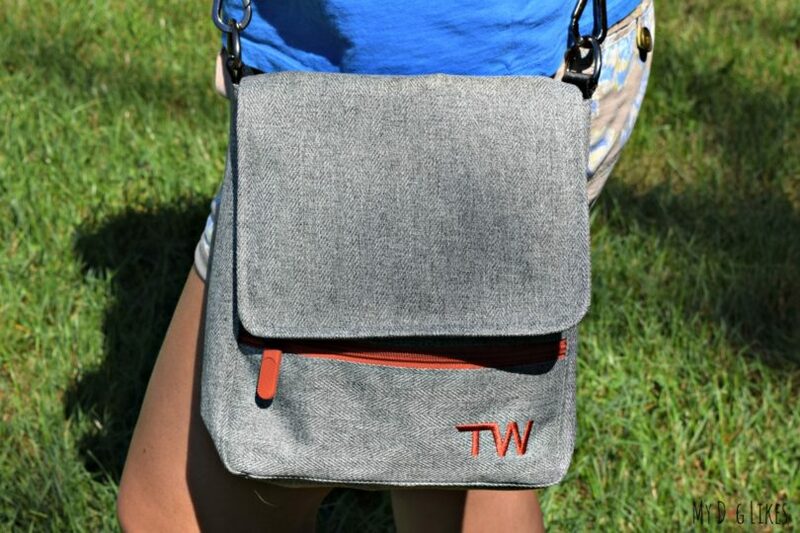 Want to get your own Travel Wags Bag? Water and collar with licenses are key. After that, it depends. I bring keys, leash, poop bags, water, flashlight, phone and snacks. Pick up bags, keys, & cell phone are critical. Anything else depends if we are just going around the block or farther afield. Love the bag! The flat waterbottle idea is great. poop bags,water bottles,dish,house keys and wet ones and cell phone. i take poop bags, sometimes an extra leash, treats, water for the girls, keys. I carry everything but the kitchen sink and need this so much. I am always fumbling. This is perfect. And it fits a nice big cell phone! water, bowl, treats, poopie bags, cell phone. I love this bag….. and the water bottle is perfect. What a fantastic bag! I bring keys, id, cash, treats, poop bags, cell phone, etc. Leash, cell phone, headphones, waste bags, and water. Leash, poppy bags, cell phone, water if we are going far, and my pup! I bring keys, leash, potty bags, water, money, phone and treats also my i.d this is great thanks for the chance. Keys, phone, water, bowl, poopie bags, wipes, ball frisbee. I always bring water and a little treat. leash, poop bags, treats(for training), cell phone, water, a small toy, and sometimes my showmanship lead if we are going to a park for training. I take poop bags, water, keys, phone, money incase we walk by a garage sale and paper and pen. water, water bowl, food (not much, more like a snack), food bowl, leash, poop bags, phone, & maybe toy (depends on weather & how she feels). mostly, though, it’s more like she “runs” me instead of me walking her! We bring the poop bags attached to leashes, phone, keys, and water if it’s a long walk. This is a great bag to carry while out on a walk. Love how they thought of everything for this bag! We need this in our lives! We take treats, poop bags, treats, water, treats, a ball, treats, frisbee, treats and a brush. Did I mention treats? This bag is such a great idea! Besides the normal items such as keys, pet waste disposal bags, cell phone, water, portable water bowl, pet toys to play catch, a can of mace, my epi pen and sometimes the occasional book. I also live within walking distance of other family and many close friends so I regularly will take gifts, food items, homemade soaps or one of the other many homemade bath, beauty, candles, or the other types of fun craft items that I regularly make and want to share with those that live nearby. It’s simply a matter of convenience just to bring these items with me while walking my dogs in order to stop by and drop the items off as I pass their homes. Not to mention I always check the mail as my last stop before heading home (our mailbox is not one that’s conveniently located right by our home) So depending on the day it can be a couple plastic shopping bags full of various items that I’m also taking for a walk! Having one of these bags would not only be super handy & organized but a thousand times more comfortable to carry while walking two dogs than flimsy noisy plastic shopping bags! Also my daughter is a professional dog trainer, so a couple of these would be Heaven sent for her and any others in this occupation! Being able to have her business name embroidered on the bag would an extra bonus! I bring all the things on our walks! Extra poo bags, phone, water, sunscreen, treats, keys, and crazy dogs! a leash, poop bags, water bottle, a little bowl and usually a toy or two. I always bring poop bags. a water bottle,phone, and small plastic container, to put water in for my fur baby. I bring my phone, keys, leash, poop bags, treats and water. I always bring water & poop bags. Cleverly designed AND stylish bag! What’s not to like?! As a professional dog walker, I can certainly appreciate this product – I always have bulky client keys on me, poop bags, and my cell phone. Depending on where I walk, I sometimes also carry a spray bottle filled with vinegar to keep stray/loose dogs away (works very nicely). I carry my keys, cell phone and poop bags! Mostly treats and poop bags, because we don’t usually venture very far from home, but I could see this coming in very handy, especially for longer walks! That water bottle idea is brilliant, and I love that it comes with a collapsible bowl! Plus I LOVE that it doesn’t look like you are carrying dog stuff. As much as I love my puppies, I also care about my style, and although I will forgo thale latter to be practical, I love it even more if I don’t have to! I typically bring my cell phone, ID, water for both of us (dog and I), a bag or two to collect poop, and often not much else. Sometimes food for the dog too. I am planning on getting pepper spray / gel soon to take as well. This bag would be so helpful and it’s very styliish! I bring my cell phone and treats. We’re a city person and a city dog, so errands and a walk are often combined… my wallet, poop bags, key, a water bottle and a collapsible bowl…. Poop bags are a must as is my cell phone.Other things depend upon where we are walking.If I am walking on our country road,my phone and bags are all I carry cause I do the bad thing and don’t lock my doors.If we are walking somewhere else I carry just about everything from poop bags to treats for him and me. I carry poop bags, water, water bowl, poop bags, treats, keys, toys, wipes. I always have a lot of stuff with me! I carry poop bags, water, bowl, treats, toys, and wipes. Oh my goodness! This looks perfect! I’ve been looking for a bag I can bring that allows me to have a water bottle, charger, phone, keys, wallet, dog treats, and of course poop bags without being too bulky! Adding this to my wish list for sure. Water, collapsible water bowl, treats, poop bags, phone, and keys. This bag is simply adorable!! I live to bring water and toys on long walks. My dogs like to take breaks a lot. Poop bags and a cell phone are a must! I bring her leash, my cell phone, poop bags, a water bottle, and her fold able bowl at the very least. Those are my must haves! Keys, bags, money, water, phone, aircard, kindle, snacks. I bring along poop bags, water, treats, and an extra leash and collar (just in case) and a small first aid kit always! treats, poop bags, and water! My little guy wears his harness and leash, of course, but I do take water, plastic bags and treats. 🙂 Thank you. I bring poo bags, my cell phone and keys (if I’m headed to the mailbox) when I take the pups for their walks. Water, cell phone, poop bag! When i walk my dogs, i always have my iphone with me to listen to music, wallet, keys, poop bags! I bring my cell phone and a water bottle. I bring a water bottle, cash, and dog treats with me on a dog walk. I don’t bring anything. I don’t go very far when walking my dog. water and bags mostly, though we don’t go very far because my doggy is 15 now. We always have poopy bags, her water bottle, keys & whatever else we will need. I take on my waks a water bottle, collapsible bowl, poop bags, lots of treats, and an extra leash for that Chunky Chocolate Lab that runs down the hill to say hi. My pup isn’t socialized very well. Thank you for your great review. Very stylish indeed! Love the water bottle too! Treats,water and a pooper scooper and a bag. I usually only have the dogs, all the leashes/harnesses, and poo poo bags. Water, leashes, dentalstix for treats to distract them. We normally only walk one block and it is an empty field in our rural area so we don’t usually pick up poo. We go walking with our 3 dogs and we carry treats, poop bags and some water for them too.We also carry items for us as well. I always bring paper towel and poop bags. For longer walks I bring water and treats. I bring cell phone, keys, water, water bowl, treats and baggies. I bring keys, leash, poop bags, water, phone and snacks. I bring water, food, treats, poopbags, cellphone, and a first aid kit. If it’s a short walk, I just take some potty bags, but if we go on a long walk, I take a water bottle and a small bowl. I love this bag, I never wear things that have pockets, so I am usually ill prepared when going on walks. Thank you for turning me on to this company! I would bring adventure items! 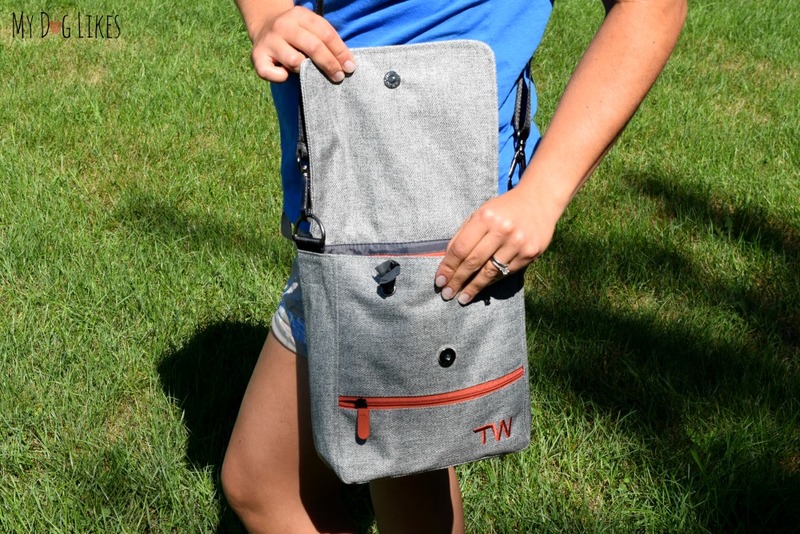 This bag looks perfect for any hike, trip, secret mission, or leisure activity! For neighborhood walks I bring poop bags, keys, & cell phone. About the same for us on short walks – and Charlie carries his own frisbee! I currently carry treats, camera, pepper blaster, cell phone and poop bags. I’ve been looking for something just like this! Very nice bag! I bring my keys, water bottle and dish, leash and collar. For my treats, phone, poop bags, extra leash. I always bring bottled water and some dog treats for my pup. Pick up bags and training treats. I always bring a water bottle. When I go for a walk I bring my keys, money, ID, phone, poop bags, wipes, water and treats. I bring water, poop bags, and a water bowl. This is a perfect bag. I am looking for something convinient like this.Thank you for useful information. I will try. wow, this bag seems versatile. But I extremely love the flat bottle. Does it go with the bag when purchasing? They really are great bags – we highly recommend! Woww! This bag is so convenient but looks stylish, too! Thanks for introducing this helpful tool! I’ll buy some. That looks like a very handy bag to use! I think it is a perfect size especially when outdoors an active pup!